Remove turkey breast from package. Lay skin side down. 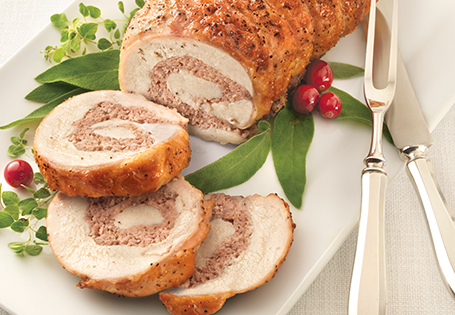 Slice each turkey breast in half crosswise without cutting all the way through. Open like a book. Repeat this process once more on each of the opened flaps, creating a large ¾-inch thick piece of meat. Be sure to keep the skin intact. Press the sausage into an even layer over the turkey breast. Roll and tie the roast, using cooking twine to secure. Rub the outside with olive oil, sprinkle with seasonings. Place on a rack in a roasting pan. Roast until internal temperature of the turkey breast is 165°, approximately 2 hours. Allow to rest for 10 minutes, then slice and serve.